Certification will allow vendors to sell morel mushrooms in Iowa. Iowa State University Extension and Outreach will host a three-hour class for anyone interested in being certified to sell morel mushrooms legally within the state of Iowa. Workshops will be available on three consecutive Saturdays in April on the Iowa State campus. Morel certification lasts for three years. Iowans who have not certified for three or more years must recertify this year. Registration is open to out-of-state individuals, but those individuals should keep in mind that local certification may be available in their home state. All three workshops will be held on the Iowa State campus in 210 Bessey Hall (2200 Osborn Drive, Ames, Iowa) from 1-4 p.m. on April 1, 8 and 15, 2017. Please register online bit.ly/Morel2017 (case sensitive), Click on "new user sign up" to begin making a reservation. Alternatively, call registration services at 800-262-0015 to register over the phone. Registration cost is $50 per person. Free parking is available near Bessey Hall in Lot 41 on the east side of Wallace Road. 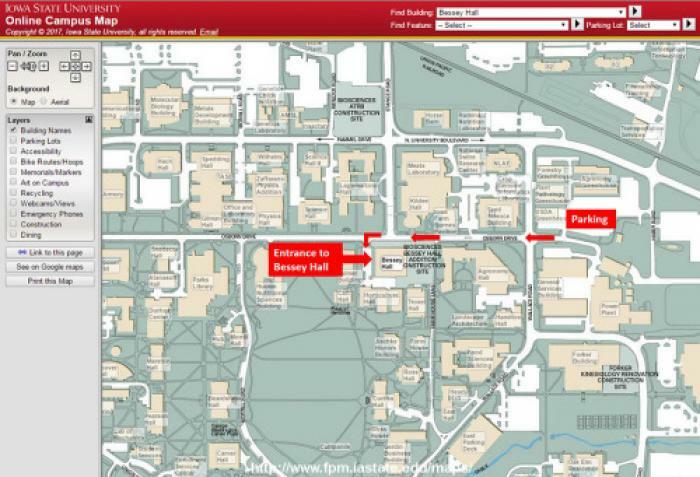 See the map with parking area marked or check the online campus map (see below). Everyone who completes the training will receive both a wall and wallet-sized certificate of completion. Contact Lina Rodriguez Salamanca, plant pathology diagnostician with Iowa State University’s Plant and Insect Diagnostic Clinic, at 515-294-0581 or pidc@iastate.edu with any questions about the training sessions. For more information on Mushroom identification http://bit.ly/PIDC-Mushrooms. Links to this article are strongly encouraged, and this article may be republished without further permission if published as written and if credit is given to the author, Horticulture and Home Pest News, and Iowa State University Extension and Outreach. If this article is to be used in any other manner, permission from the author is required. This article was originally published on February 10, 2017. The information contained within may not be the most current and accurate depending on when it is accessed. Morel Identification Workshops, Just Around the Corner!